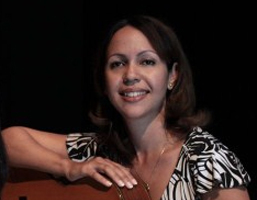 Zuleida Suárez Ricardo is a Cuban professional guitar player, co-founder and director of the guitar duo Con-Trastes. She is also an assistant director of the Guitar Orchestra Sonantas Habaneras conducted by Cuban guitarist Jesus Ortega. In 2014 she performed at the Miami Performance International Festival, in Miami Beach, Florida, and offered a serie of concerts with Con-Trastes in the South of France as part of the promotion of their first album. She has organized and conducted many concerts of chamber music and has performed at important national and international festivals like Havana Contemporary Music Festival, Havana Chamber Music Festival, American Winds Festival, Havana International Guitar Festival, Identity Festival, Leo Brouwer Chamber Music Festival and Miami Performance International Festival among others. Suárez has performed in the most prestigious concert halls along the country like the “Basílica Menor del Convento de San Francisco de Asís”, “Teatro Nacional de Cuba” and “Gran Teatro de La Habana”. Suárez has a special interest in performing Cuban and Latin-American music for guitar. In 2012 she recorded “Jesus Ortega and Cuban Guitar” and “Cuban Landscape with Sonantas”, a double album with Sonantas Habaneras Guitar Orquestra under the Colibri music label. In 2014, Duo Con-Trastes recorded their first and highly acclaimed album “Contrastes”, an independent production with the collaboration of the Hermanos Saiz Association and the Noruega Embassy in Cuba. She has also recorded with Cuban singer Liuba Maria Hevia under Bis Music label. Born in Havana, Cuba, on July 7th, 1982, she started to play the guitar at the age of 10 at Alejandro Garcia Caturla Music Conservatory and continued her studies at the National School of Music. Suárez holds a Bachelor’s Degree in Music with a Major in Guitar Performance from the Superior Art Institute of Havana. She is a member of National Center for Concert Music, the Cuban Union of Writers and Artist (UNEAC), and the Saíz Brother´s Associations (AHS).